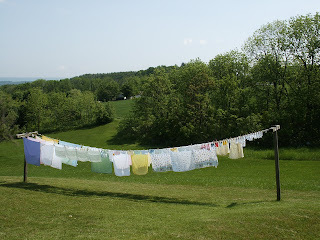 Baby laundry drying in the warm May sun of 2003. The lush green grass of my parent's Pennysvania home reminds me that winter is not the only season God gave us. This year's winter started in November and is just now letting spring have a turn. What a lovely scene and what a clothes-hanger you are! !I'm impressed! Yes, what a charming setting and picturesque spring day. I'd like a repeat of that, any time. Why did I buy this? ?